I apologize to the Dynasty students who are absent from this list. If you are not listed it is because I did not know your college choice! The 2014 class won’t be featured until May of 2014 even though I know several students have already made verbal commitments. 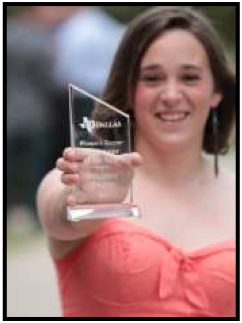 Dallas GK Macaire Ament was recently voted Newcomer of the Year for the 2012-2013 women’s soccer season. As a freshman Macaire played the second half of every regular season and playoff game and also played all the overtimes. Two Dynasty students were honored during W-League play this summer. In Week 2 of play Rose Hull (sophomore at Furman University) was named to the Team of the Week (1st Team) and Jesse McGinley (sophomore at UNC-Greensboro) was named Honorable Mention in both Week 2 and Week 9 of play. In Week 2 Carolina Elite goalkeeper Rose Hull made five saves over Tampa Bay earning her first shutout. And Fredericksburg Impact goalkeeper Jesse McGinley earned her first start and helped her team to their first point playing 90 minutes against the New York Magic. She made 4 saves and one critical diving box on a corner kick in the 1-1 tie. “Going into the game as a team we needed to perform better as a whole and we achieved that. I knew individually I had to communicate and organize the team well, specifically on the back line, from the start and finish of the game.” McGinley said. In Week 9, McGinley made a significant contribution in goal over the New Jersey Wildcats, coming up big again as she and her teammates made history for the ladies of Fredericksburg. McGinley came up with consecutive shutouts by the score of 2-0. These were the first two consecutive shutouts for the Impact in their three year history. Kaele continues to rack up athletic honors despite the fact that she graduated from Emory University this past May! She was recently named to United States Track and Field and Cross Country Coaches Association (USTFCCCA) All-Academic Track and Field Team, for her academic and athletic achievements during the 2013 season. As many of you may recall Kaele was a 2 sport standout athlete at Emory in goal for the women’s soccer team as well as on the track for the indoor and outdoor track teams. Leonard finished her Emory career with four All-America honors – two for her efforts during the indoor season and two for her work outdoors. This past year, she claimed indoor All-America honors with a sixth-place finish in the 400-meter dash and a seventh-place finish in the 4×400-meter relay, in addition to a seventh-place finish in the 400-meter dash during the outdoor season. She is the Emory record holder in both the indoor (56.94 seconds) and outdoor (55.85 seconds) 400-meter dash, and is part of the school-record setting 4×400-meter indoor and outdoor relays. Leonard graduated with a 3.399 GPA as a Neuroscience and Behavioral Biology major. In addition Kaele was awarded Emory’s Bridges Award for most outstanding all-around athlete at Emory. As any of the fellow goalkeepers out there reading this know from experience it is EXTREMELY hard to split time with another goalkeeper. Kaele and Erica split time their entire career at Emory University and managed to forge a friendship while doing so. I think their story is very rare and is a tribute to their personalities and dedication to TEAM first. It began with an unpleasant surprise. But, for Stein and Leonard, that unpleasant surprise morphed into what has become a lasting friendship, which extends well beyond the white lines surrounding Emory’s pitch. Together, they’d go on to participate in and eventually oversee Emory’s successful Relay for Life cancer fundraiser. They’d also split time – almost evenly – in goal. For the past three seasons, Emory has had defied soccer convention and fielded two goalkeepers in every match. Stein started each one while Leonard was always called upon when the second half began. And despite their disparate styles of play – Stein is cerebral, Leonard more athletic – their minutes played, goals allowed and save percentages mirrored each other’s through their careers. The Eagles rode the unique arrangement to a UAA conference championship in 2011 and an appearance in the DIII Women’s National Championship Game last season. Through it all, competition, ego and jealousy were never strong enough to fracture their friendship or hinder their successes on and off the field. Involvement at the committee level led to the pair being named co-chairs of the event by their senior year. 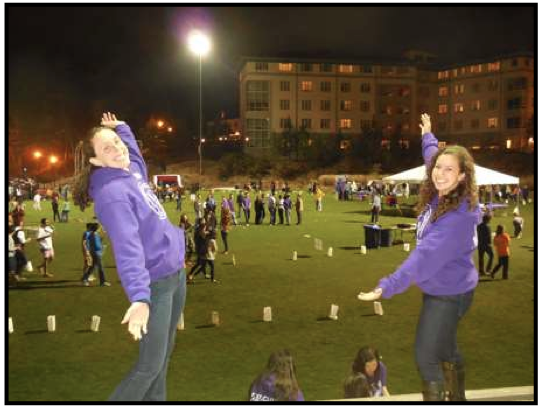 This year, the duo successfully pushed for Relay for Life to become a chartered organization at Emory, which meant the school would offer financial support for the event. 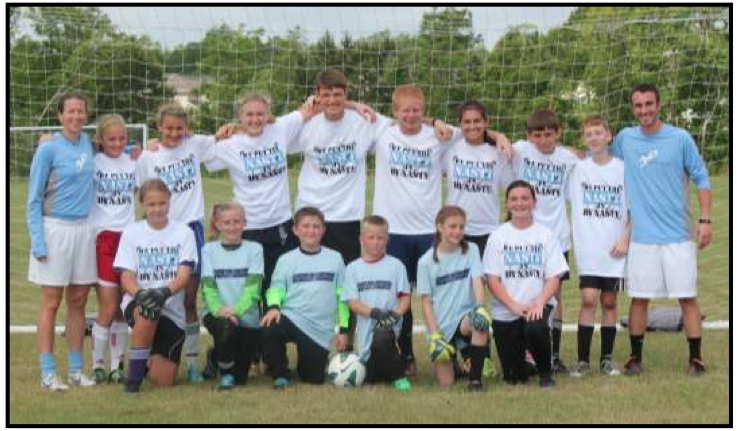 As they balanced soccer and class with their responsibilities to the charity, which involves overseeing a 52-person executive committee, the duo helped raise more than $61,000 for the American Cancer Society. Emory recognized this year’s relay – held on March 29, 2013 – with the school’s Outstanding Service Program of the Year award. The event’s impact is plainly visible on campus, which is home to an American Cancer Society Hope Lodge – a refuge for cancer patients to stay in free of charge while they receive treatment. The money raised by Relay for Life helps support services like the Hope Lodge as well as research; Emory has several active American Cancer Society research grants. Under Stein and Leonard’s leadership, Emory’s Relay for Life has generated more than $61,000 thus far in 2013. Their success with Relay for Life, however, could’ve been derailed had things not gone smoothly on the field. When their sophomore season arrived, Stein and Leonard both knew they’d be competing for the starting goalie spot. That was the only time their friendship was tested, they say, the only time that the competitive tension was palpable. Given their different styles of play, they assumed one would win out. Stein is the shorter of the two, but fundamentally skilled, adept at organizing the defense in front of her and calm in the face of a fast break. Leonard, meanwhile, is taller, more athletic – she was also an All-American in the 400 meters for Emory’s track and field team – and skilled in the air. Early in that sophomore season, Patberg started to give Stein time in goal during the first half and brought in Leonard in for the second, assuming that one of the goalies would eventually start making enough mental mistakes to take herself out of contention. But that never happened. The Eagles finished the year 16-2-4, took second-place in their conference and made the ￼ quarterfinals of the NCAA Division III Women’s Soccer Championship. The next season, as juniors, Leonard played only 39 more minutes than Stein – Leonard played more due to overtimes – and their statistics were nearly identical. Stein allowed two goals to Leonard’s three and Stein’s save percentage (.882) was nearly on par with her teammate’s (.909). On this season’s march to an eventual 1-0 loss to Messiah in the NCAA championship final, their numbers were oddly similar again. Each keeper allowed six goals and Stein and Leonard saved 85 percent and 86 percent of the shots taken against them, respectively. With the team thriving, neither sought more playing time. Through it all, Patberg never heard complaints from other players about the team’s unconventional arrangement in goal. Eventually, she said, picking one over the other would’ve done more harm than good, so she simply stuck with what was working. Despite the duo’s success, Patberg doesn’t intend for time-splits to become the norm at Emory now that Leonard and Stein have graduated – both received their diplomas in early May. The chemistry likely couldn’t be duplicated. Stein now wants to pursue a career in advertising or marketing, while Leonard has her sights set on medical school. While their paths will lead in different directions, they both say they’ve made a lifelong friend out of what could’ve been a four-year nemesis. After a standout fall season with the Seminoles, Florida State rising senior gk Kelsey Wys is back in the mix with the National Team! She was recently invited in to train with the U23 US Women’s National Team at the Home Depot Center in Carson, CA. No stranger to the national team program, Kelsey has been a part of the youth national team pool at the U17, U18, and U20 levels. She is FSU’s all-time career record holder for wins (51), shutouts (30.0) and starts (68). Congrats Kelsey! 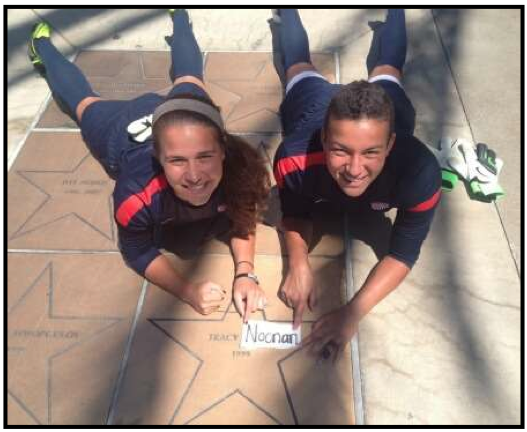 Two of our Dynasty students recently were called into to training camp with the U18 U.S. Women’s National Team at the Home Depot Center in Carson, CA. This was Rose’s first event at the youth National team level, while Darien is becoming a mainstay having been called in for all three camps in 2013. Rose’s quote when I asked her how camp was going? “I love this level and I never wanna go home!” I love it! 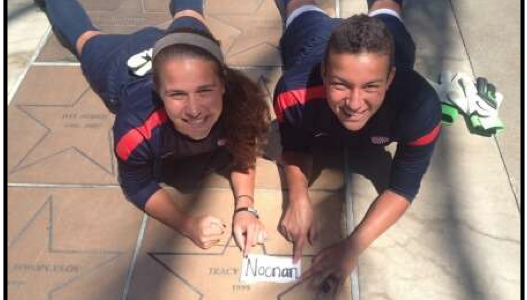 Here is the photo of Rose & Darien at the Home Depot center ‘updating’ their￼ coach’s 1999 Women’s World Cup star from Tracy Ducar to TRACY NOONAN! 🙂 Thanks guys! After Ball’s second goal, the Bobcats (21- 2-1) threw everything at the Wildcats defense, but Second Team All-Region goalie Kelsey Kilgore and the Wildcat defenders repelled each attack, including a ball that Kilgore plucked out of midair, in the midst of white-and-purple jerseys. Kilgore, allowed no more than one goal in any game this season, including shutouts of Mills Godwin and Douglas Freeman in the Colonial District tournament, Glen Allen in the Central Region opening round and Kellam and Colonial Forge in the state quarters and semifinals, respectively. “I just put everything out on the field,” she said. 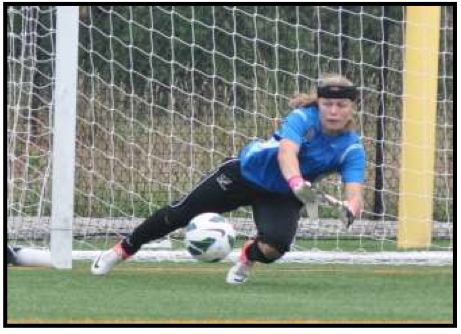 Kelsey’s team finished 24-0-1 and she had 20 shutouts out of 25 games!!! In the other five games, she only gave up one goal in each game. 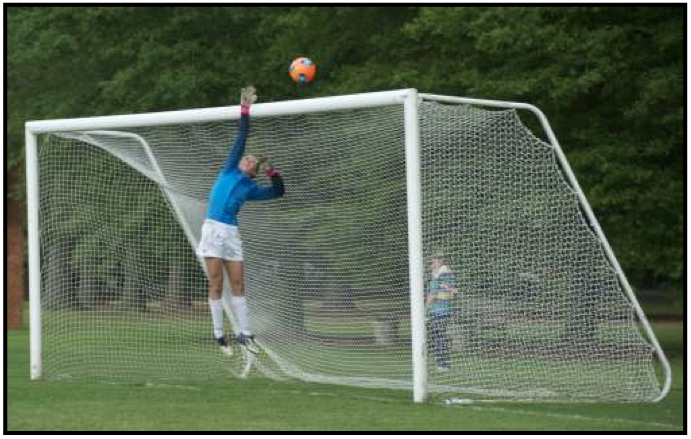 Here is a nice save by Mikayla in action sporting her Dynasty 3⁄4 pants at ECNL Nationals. Unfortunately her team, U15 Concorde Fire, lost 3-0 in this game against Real Colorado. 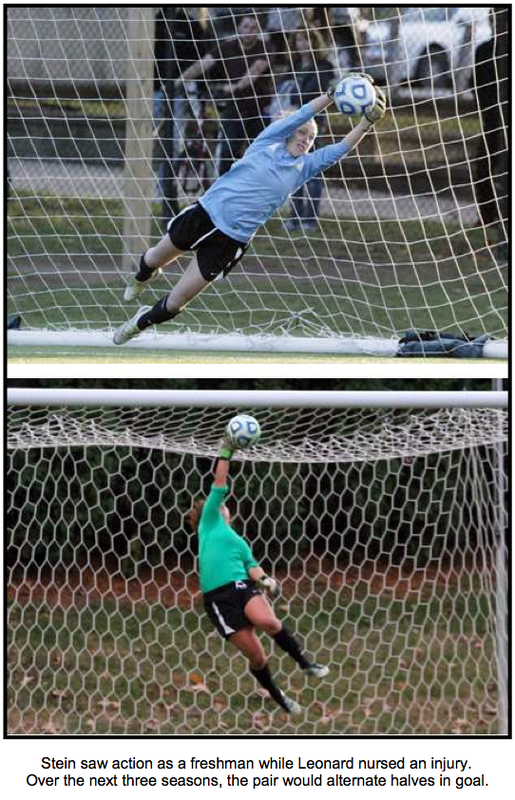 Congratulations to Norfolk Academy junior goalkeeper Emily Martin for being named All-TCIS goalkeeper this season! 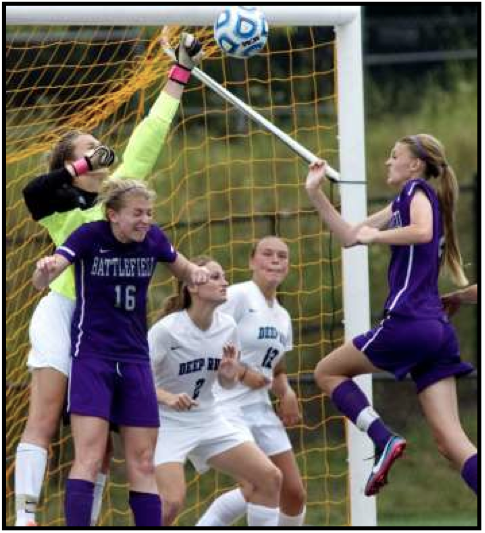 Here is a photo from a recent game of her soaring to tip a ball over the bar. GREAT UPS, EM!